Anyone traveling from Europe and to the US will inevitably cross Greenland. If you are lucky, the weather will be clear, and you can because of the low humidity see for 100’s of miles. Such was the case when I first flew from Copenhagen to JFK/New York in August 1979. 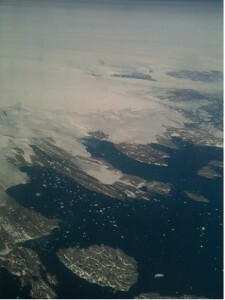 Approaching Greenland, an entirely white landscape unfolded dotted with floating icebergs. On a recent return trip in July 2012, my path was roughly the same. To my astonishment I saw barely any icebergs, and large swaths of coastline with nothing but exposed bedrock. Continuing inland, there were long stretchmarks in the ice. A week after my arrival, we could in the news read about massive ice melts and flooding in Greenland. This entry was posted in Climate Change on September 1, 2012 by mogens.